I started Friday morning back at the Phila International Airport at 7 AM to try to see that Snowy Owl again. I busted for a 7th time. That owl just doesn’t want me to see it! Here is a link to the Project Snow Storm map of "Philly's" movements. (http://www.projectsnowstorm.org/maps/philly/) I have spent hours looking at runway 27R without seeing the owl. Ugh. After giving up, I picked up donuts for the office and then my coworker Mark and I headed out to York PA for a client meeting. 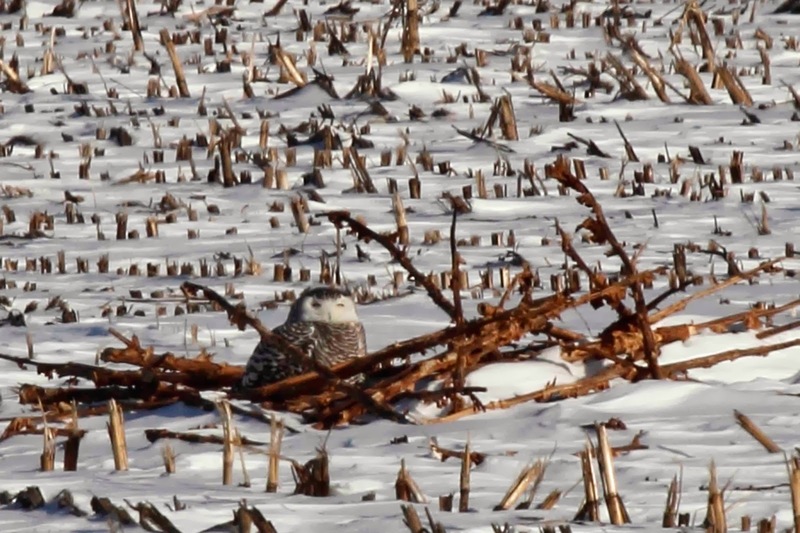 We left the office a little early so that we would have some time to scour the farms in Lancaster County for the Snowy Owls that have been reported there. We headed to Farmersville Rd first and found a murder of crows. They were casually picking at the corn stubble. We figured that there was no Snowy Owl in the area since the crows would have probably found it and harassed it already. We drove around the area slowly using the flashers. This is Amish country so it was interesting to see the horse and buggies, teens on bicycles and laundry hanging out on the wash line in 5 degree weather. That laundry was as stiff as a board! No owl to be found but we did get great looks at a single Lapland Longspur amongst the Horned Larks in one of the fields. If you have been reading this blog carefully over the past year or so, you know that the LALO (short-hand for Lapland Longspur) was almost impossible for me to see for the contest. I only got a glimpse of 2 as they flew past us on Stone Harbor Point only to disappear in the dune grass. The experts were right. 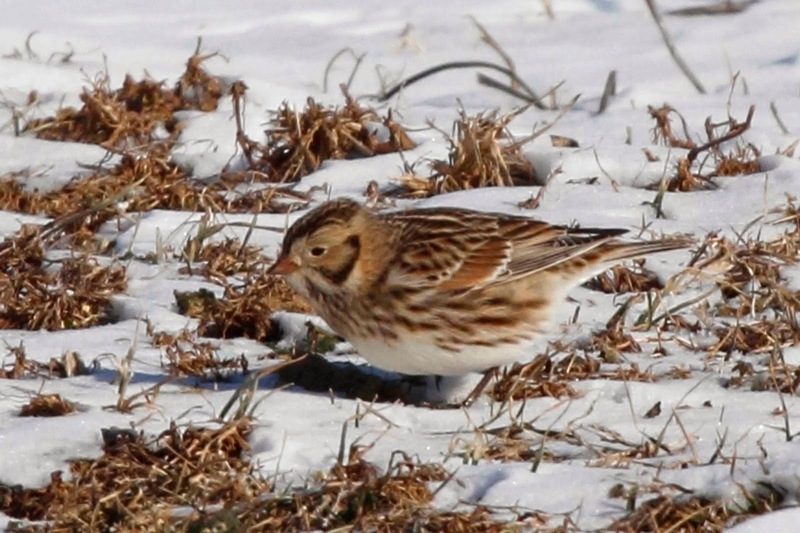 They told me that Lapland Longspurs are much easier to spot when there is snow on the ground since they tend to be near the edge of the fields where the ground is exposed. That is precisely where we found this juvenile LALO. He is not much to look at now, but he will be handsome come summer when he sports a black throat and rich cinnamon neck. We met another carload of birders from Maryland who also could not find an owl. We gave up and headed to our meeting with an empty feeling. We met a really nice new client at York YMCA. Turns out that he is from Philly - a Father Judge HS graduate! I had sent out a note to the PA Birders email list on Thursday asking for information about the Lancaster birds. I received many responses but it was Bob Ferguson’s info that inadvertently paid off – he suggested Habecker Church Rd which we hit after our meeting. We didn't see an owl there, but we did meet another couple who were looking for that owl too. The driver told me that he just left the Musser School Rd owl so that is where we headed. The guy gave us great directions and viola! My coworker got his lifer Snowy Owl and I got #8 – a beautiful dark female owl. She was tucked in with some tobacco stubble. 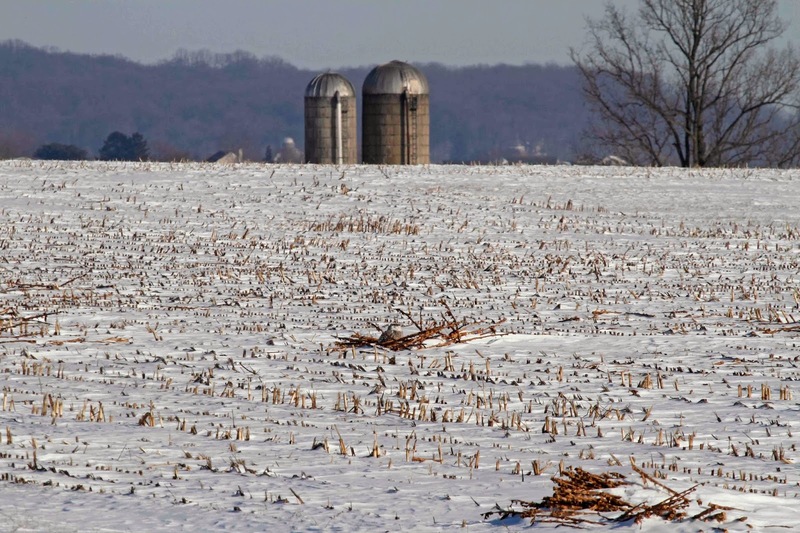 Here is the idyllic Amish farmland scene. Can you find the owl? Look closely at the pile of sticks in the center of the field. The owl is sitting right there. Talk about great camoflage! Here is a cropped view showing the owl. She occasionally looked over at us but we were pretty far away so she wasn't concerned at all. It was a great ending to the day since Mark got to see a Snowy Owl. We also showed the owl to a passerby. 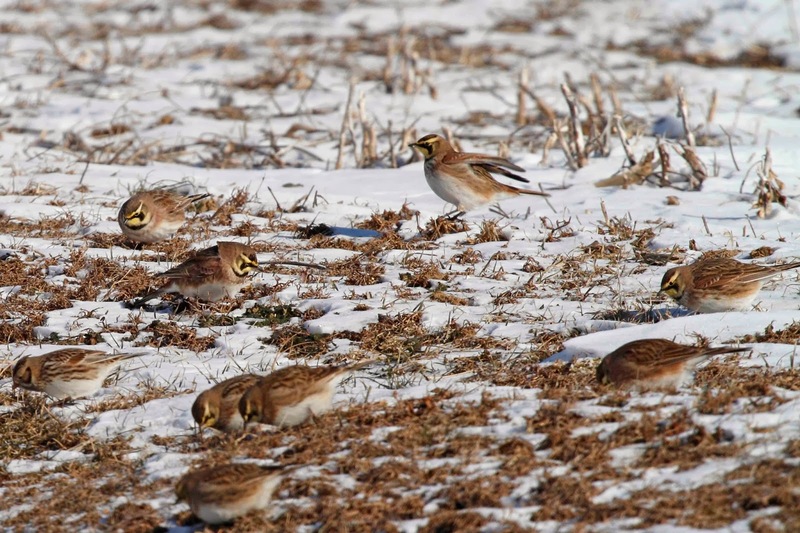 We are supposed to get another arctic "clipper" today, so no more owl chasing until next week. For now, I'm stuck at 8. 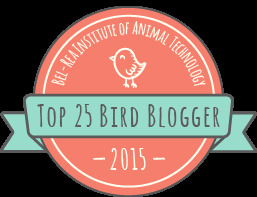 Have you trapped Mark Mason into becoming a birder? Saw the same female in the same spot on Musser School Road this afternoon (1/25) in the snowstorm. Life bird. Majestic Snowy! Thanks for the Snowstorm link to Philly's map--it helped us track him down and see our Lifer Snowy Owl! After not seeing any snowies at Forsythe on Saturday, we studied Philly's map and noticed he seemed to have a pretty regular routine. We were able to do a stakeout in the cell phone waiting lot and sure enough, he came by after a couple hours. The map showed that most days around 6-6:40pm he perched on a wooden pole near the 95N off ramp for exit 12. It's visible from the far end of the cell phone lot, and he flew in tonight at 7:10pm. Our pics were terrible, but it was still so amazing to see him. If you aren't having luck with the runway spotting, maybe this will work for you! Thanks for the info. i plan to stakeout the cell phone lot for Philly on Friday. Any contacts You have that I could reach for the latest news from New Holland PA? I am heading out there next week. Would appreciate any help.